LUVVITT MASTER Sleeve is made of high-density ballistic nylon exterior and features a cutting-edge technology; air-channeled interior bubble pads that absorb the shocks. For extra protection, two tubes run around the edges of your tablet inside the sleeve for extra protection while creating a wall between your tablet and the zipper to prevent your tablet being scratched by the sipper. A separate, hidden front compartment provides a divided space for your other accessories, chargers, external battery pack, wallet, cell phone, keys etc. - Air channeled, shock-absorbent interior bubble pads created with cutting-edge technology. 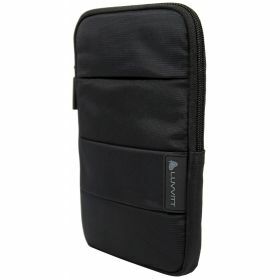 - Drop protection twin-tubes surround the edges of your tablet inside the sleeve for extra protection. Also prevents your tablet being scratched by zipper.